The Bronx River, approximately 24 miles (39 km) long, flows through southeast New York in the United States and drains an area of 38.4 square miles (99 km2). It is named after colonial settler Jonas Bronck. The Bronx River is the only fresh water river in New York City. It originally rose in what is now the Kensico Reservoir, in Westchester County north of New York City. With the construction of the Kensico Dam in 1885, however, the river was cut off from its natural headwaters and today a small tributary stream serves as its source. The Bronx River flows south past White Plains, then south-southwest through the northern suburbs, passing through Edgemont, Tuckahoe, Eastchester, and Bronxville. It forms the border between the large cities of Yonkers and Mount Vernon, and flows into the northern end of The Bronx, southward through Bronx Park, New York Botanical Garden, and the Bronx Zoo and continues through urbanized areas of the South Bronx where it divides East Bronx from West Bronx. It empties into the East River, a tidal strait connected to Long Island Sound, between the Soundview and Hunts Point neighborhoods. In the 17th century, the river - called by the natives "Aquehung" - served as a boundary between loosely associated bands under  The Algonkian significance of the name is variously reported; the acca- element, as represented in the Long Island place-name Accabonac, was deformed into the more familiar, suitably watery European phoneme aque-. The tract purchased by Jonas Bronck in 1639 lay between the Harlem River and the river that came to be called "Bronck's river". In the 21st century, environmental groups including the Bronx River Alliance proposed to return the river to its original state as a clean waterway. The river became a favorite project of U.S. Representative José Serrano, who secured US$14.6 million in federal funding to support the rehabilitation of the waterway, into which some Westchester towns continued to discharge raw sewage intermittently, as sanitary sewer overflows, as late as 2006. Under a November 28, 2006 agreement, the municipalities of Scarsdale, White Plains, Mount Vernon and Greenburgh agreed to stop dumping sewage in the Bronx River by May 1, 2007.
stormwater pollution and improve water quality. 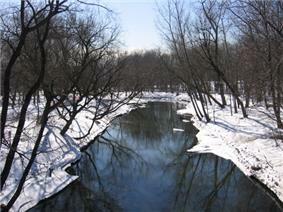 The river in winter time. Local alewife, taken from a coastal tributary in nearby Connecticut, were released in the river in March 2006. The alewife were expected to spawn in the river's headwaters. Their offspring would spend the summer in the river, migrate out to sea in the fall, and in three to five years return, like all anadromous fishes, to their spawning grounds. Stocking was intended to be repeated annually for the following five years, to build up the new resident population. The fishes, among a group called "river herring," feed low on the food-chain and help reduce eutrophication. 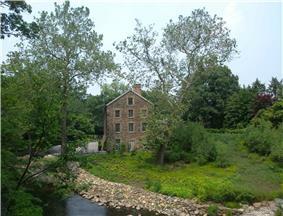 And in fact, several adult alewife were found below the first dam on the river on April 7, 2009. As an analysis revealed they were 3 years old, the assumption of scientists is that these were in fact descendants of the alewife released 3 years before in March 2006. The next step will be to erect fish ladders over the 3 dams lowest on the river, allowing the alewife access to a portion of the river with more suitable spawning habitat. In February 2007 biologists with the Wildlife Conservation Society, which operates the Zoo, spotted a beaver (Castor canadensis) in the river. "There has not been a sighting of a beaver lodge or a beaver in New York City for over 200 years. It sounds fantastic, but one of the messages that comes out of this is if you give wildlife a chance it will come back," said John Calvelli, a spokesman for the Society. The beaver is named Jose Serrano, after the Congressman, and was sighted below the East Tremont bridge at Drew Gardens as recently as June, 2009. Beaver had not lived in New York City since the early 19th century when trappers extirpated them completely from the state. In the summer of 2010 a second beaver joined Jose, doubling the beaver population in New York City. Beaver were once important to the city's economy and pair of beaver appear on the city's official seal and flag. Along much of its length in Westchester County and the northern Bronx the river is paralleled by the Bronx River Parkway and its associated bicycle path from Bronxville to the Kensico Dam plaza. A project, the Bronx River Greenway, proposes a unified management plan for the narrow ribbon of riverside green spaces in the 8 miles (13 km) stretch of river that passes through Westchester County and The Bronx, as part of the East Coast Greenway. It includes a Concrete Plant Park on the right bank, below Westchester Avenue and Starlight Park above there. In the southern Bronx, the river has become a popular destination for urban canoeing in New York City. It also bisects Bronx Park and the Bronx Zoo. A tram built in the late 20th century takes Zoo customers over the river to an exhibit of Asian animals on the left bank, with a narration presenting the river as the Irrawaddy. ^ "USGS 01302020 BRONX RIVER AT NY BOTANICAL GARDEN AT BRONX NY". waterdata.usgs.gov. USGS. Retrieved 13 October 2014. ^ "Kensico Reservoir". http://www.dec.ny.gov/. New York State Department of Environmental Conservation. Retrieved 13 October 2014. 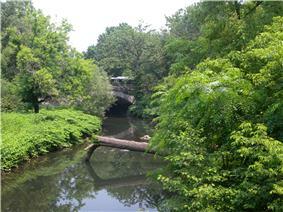 ^ "USGS 01302020 BRONX RIVER AT NY BOTANICAL GARDEN AT BRONX NY". http://waterdata.usgs.gov/. USGS. Retrieved 13 October 2014. ^ "USGS 01302020 BRONX RIVER AT NY BOTANICAL GARDEN AT BRONX NY". http://nwis.waterdata.usgs.gov/. USGS. Retrieved 13 October 2014. ^ a b Shaw, Richard K.; Reinhardt, Lindsay; Isleib, Jacob. "Soil Survey of Bronx River Watershed Bronx, New York" (PDF). http://www.nycswcd.net/. USDA. Retrieved 13 October 2014. ^ Berger, Joseph (2010-07-19). "Reclaimed Jewel Whose Attraction Can Be Perilous". ; all the other rivers within the city are straits and tidal estuaries, and the tidal lower reach of the Hudson River. ^ a b Barbara Shay MacDonald (Scarsdale Historical Society), "The Bronx River: Boundary of Indian Tribes, Colonies, Manors, Cities and Villages"
^ , 1906, offers "Peace Place"; [http://macaulay.cuny.edu/eportfolios/thegreenerapple/2009/12/18/the-bronx-river-alliance/The Bronx River Alliance, "River of High Bluffs"Proceedings of the New York Historical Association; New York City Parks Dept: "River of High Bluffs"
^ "...a certain Tract of land bounded on the east by the river Aquehung or Bronxkx to the midst of the river..." is part of the description of the tract called West Farms in an agreement of 12 March 1663 signed by nine sachems and Edward Jessup and John Richardson, quoted in A. Hatfield Jr., "Early Settlers of West Farms", New York Genealogical and Biographical Record (1913), reprint p.4f. ^ Bronx River Alliance. Bronx, NY. "What We Do." Accessed 2009-02-26. ^ "Cuomo Announces 5 Major Water Pollution Settlements: Over $8 Million To Be Used For Water Protection". www.ag.ny.gov. New York Attorney General. Retrieved 14 October 2014. ^ Westchester County Department of Planning, White Plains, NY. "Bronx River Watershed Coalition." Accessed 2009-02-27. ^ City of New York. Department of Parks & Recreation. "Herring return to the Bronx." The Daily Plant (newsletter). March 28, 2006. ^ "Parks Finds Alewife In Bronx River For First Time Since 1600s" (Press release). New York City Department of Parks and Recreation. April 9, 2009. Retrieved February 27, 2010. ^ Anahad O'Connor (February 23, 2007). "After 200 Years, a Beaver Is Back in New York City". New York Times. Retrieved Dec 4, 2009. ^ "New York City Beaver Returns". Science Daily. Dec 20, 2008. ^ Trotta, Daniel. "Beaver Returns to New York City After 200 Years." World Environment News. Dec. 26, 2007. ^ Peter Miller (Sep 2009). "Manhattan Before New York: When Henry Hudson first looked on Manhattan in 1609, what did he see?". National Geographic. ^ Barry Paddock (2010-09-19). "Another beaver makes Bronx River home - doubles total beaver population". New York Daily News. Retrieved 2010-09-19. ^ Concrete Plant Park NYC Parks Dept.